Lumad, a Bisayan word for “native” or “indigenous,” refers to non-Christian and non-Muslim indigenous groups in Mindanao. In general, lumad music encompasses a wide repertoire of sounds performed for various occasions, and makes use of an extensive array of musical instruments, including the agong, the most widely distributed brass instrument among the Mindanao lumad. The biggest group of lumad is the Subanen (Subanon, Subanun) of Zamboanga del Norte and Zamboanga del Sur. Their vocal music is characterized by chants and different types of songs such as the dionli (love song), buwa (lullaby), and giloy (funeral song), among others. Their musical instruments include the gagong, kolintang, and durugan. The Manobo (Manuvu, Minuvu) inhabit core areas from Sarangani island and the provinces of Agusan del Sur, Davao provinces, Bukidnon, and North and South Cotabato. The Manobo are “probably the most numerous of the ethnic groups of the Philippines in terms of the relationships and names of the various groups that belong to this family of languages.” (NCCA) Their vocal music types include ritual songs, narrative songs, lullabies, and songs of nature, that may also be accompanied by rhythmic sounds from the singer’s armpit. The T’boli, the indigenous people of South Cotabato, perform various songs for different occasions and sentiments, like weddings and fishing, and when they are joyful or sad. Their music reflects their closeness to nature through the imitation of natural sounds. Among their several musical instruments is the hagalong, a long slender spindle-shaped two-string guitar. 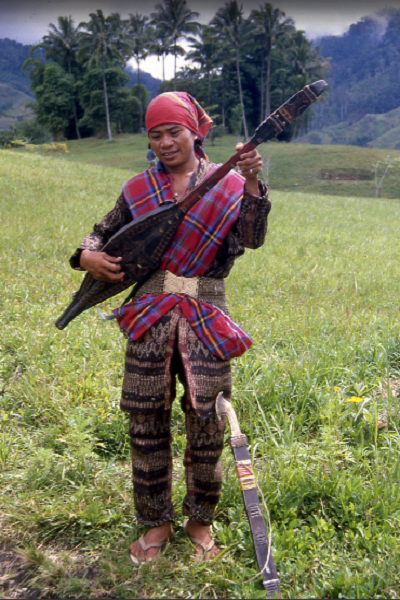 The Tiruray, the traditional hill people of southwestern Mindanao, also have a wide range of songs like the balikata (melodic pattern for debates, converstions), lendugan (love song), siasid (prayer), foto moto (teasing song during weddings), and meka meka (song of loyalty by a wife to her husband). They are among those with the most developed agung ensembles. The Mansaka from the provinces of Davao del Norte and Compostella Valley, are among the most dominant ethnic group in Compostella Valley province. Among their wide array of musical instruments is the gimbal, a drum made of bahi or betel nut and animal hide (doeskin and male deerskin). Their musical forms include the saliada which is similar to ballad, and bayok on love and adventure. The B’laan (Bilaan) of Davao del Sur also have a wide range of instruments such as idiophones (percussions), zithers (bamboo tubes with strings), chordophones (wooden lutes), and aerophones (flutes and reeds). They also make use of the tangungo, a set of 8 metal gongs hung on a harness. Music from these instruments accompanies their ritual sand dances. The Bagobo are among the largest groups of indigenous peoples of southern Mindanao, inhabiting areas from the west coast of Davao Gulf to Davao’s well-known mountain ranges of Mt. Apo. Their music forms part of their religious and festive occasions as well as daily activities, which include advice songs, children’s songs and lullabies, among others. Their musical instruments bolang-bolang and pagakpak are related to agriculture as their design and sound are meant to please gods, to reward them with bountiful harvests. Other lumad groups in Mindanao include the Higaonon, Banwaon, Talaandig, Ubo, Tagakaolo, Dibabawon, and Manguangan. Tiongson, N. (Ed.). (1994). CCP Encyclopedia of Philippine Art (Vol. 1-2: Peoples of the Philippines). Manila: Cultural Center of the Philippines.